DONALD AVERY. — "Dangerous Foreigners": European Immigrant Workers and Labour Radicalism in Canada, 1896-1932. HUGH JOHNSTON. — The Voyage of the Komagatu Maru: The Sikh Challenge to Canada's Colour Bar. MICHAEL MITTERAUER. — Grundtypen alteuropäischer Sozialformen. Haus und Gemeinde in vorindustriellen Gesellschaften. | WINFRIED SCHULZE. — Bäuerlicher Widerstand und feudale Herrschaft in der frühen Neuzeit. H.-U. WEHLER, ed. — Klassen in der europäischen Sozialgeschichte. HARVEY J. GRAFF. — The Literacy Myth: Literacy and Social Structure in the Nineteenth-Century City. R. S. NEALE. — Class in English History, 1680-1850. CECIL J. HOUSTON and WILLIAM J. SMYTH. — The Sash Canada Wore: A Historical Geography of the Orange Order in Canada. ALICE HANSON JONES. — Wealth of a Nation To Be: The American Colonies on the Eve of the Revolution. ANTOINE SYLVÈRE. — Toinou, le cri d'un enfant auvergnat. ALAN F. J. ARTIBISE and GILBERT A. STELTER, eds. — The Usable Urban Past: Planning and Politics in the Modern Canadian City. | ALAN F. J. ARTIBISE and GILBERT STELTER. — Canada's Urban Past. 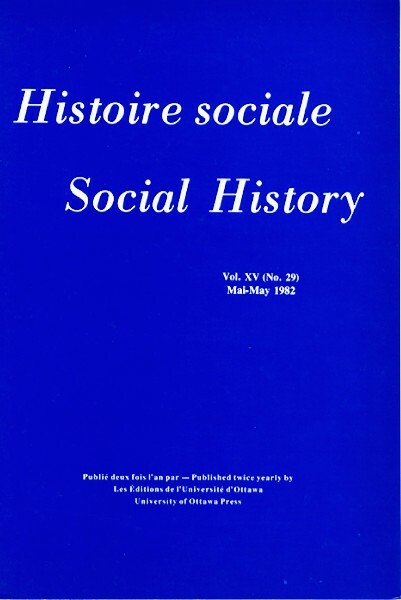 A Bibliography to 1980 and Guide to Canadian Urban Studies. FRANCES J. SHAW. — The Northern and Western Islands of Scotland: their Economy and Society in the Seventeenth Century. I. R. M. MOWAT. — Easter Ross 1750-1850: The Double Frontier. GREGORY S. KEALEY. — Toronto Workers Respond to Industrial Capitalism, 1867-1892. IAN ANGUS. — Canadian Bolsheviks: The Early Years of the Communist Party of Canada. P.-A. LINTEAU, RENÉ DUROCHER and J.-C. ROBERT, Histoire du Québec contemporain: de la Confédération à la crise (1867-1929). RODERICK PHILLIPS. — Family Breakdown in Late Eighteenth-Century France: Divorces in Rouen, 1792-1803.